Notification of new pictures in the gallery, as well as artist events, exhibitions and appearances. To subscribe to more in depth, behind the scenes content, videos, sneak peaks, and advance collectors' purchasing options, please check out our Patreon. Lots of free material in the first few posts to give you an idea of where I want to go with this adventure, but mostly I want to have a space where I can begin to create more video material (that has been often requested of me in recent years) and to share a lot more of what goes on behind the scenes. I hope you take a moment to take a peek, explore, and maybe stick around! Succulent Dragons is a Coloring & Art Book, and is currently an active project on Kickstarter. It features 31 of my ink drawings celebrating the beautiful symmetry, patterns, and forms found in these mandala-like sculptures of nature, combined with whimsical fantastical creatures. Also several original drawings and paintings are currently being offered via the Kickstarter campaign, so if you haven't yet had a chance to explore it, I do hope you come to check things out. 2018 Guests of Honor are Jason Denzel & Stephanie Law. Toastmaster is Aubree Pham. I'll be participating in many of the panel talks, as well as doing a slideshow and painting demo of my own work, so if you're in that part of the country, hope to see you there! Filoli’s 20th Annual Botanical Art Exhibition celebrates the abundance of spring flowers in the Estate’s magnificent historic Garden. The beautiful and extraordinarily accurate flower portraits are painted by international and local artists, some of them graduates of Filoli’s Botanical Art Certificate Program. Media used to create botanical paintings include watercolor, colored pencil, pen and ink, oil, and graphite. Two of my botanical paintings are a part of this exhibit. It's well worth the visit if you've never been to Filoli, as the estate houses an amazing garden filled with blossoms that will be in abundance given the recent Spring rains. Prints, as always, are available on the site for most of these pieces. $16.95 for 8.5x11 inch and $26.95 for 11x17. Check the individual image pages for original painting availability. Another installation of the Stag Sonata Cycle. The pieces in this series are all based around musical terms, used to denote the mood and pace for a piece. The word for this one is "amoroso", which means "loving". Bits of Divinity II - I've painted lots of little bit and pieces of botanical art, insects, and fossils over the years. This piece is actually a digital collage of many of those miniature paintings brought together. This is a series that keeps pulling me back time and again. I anticipate I might do more in the years ahead, but the original concept for this was a shifting of worldview and the importance of the small and unnoticed elements in our surroundings. Alice in Through the Looking Glass, and Gerda in The Snowqueen have discussions with flowers, and they are surprised (and not a little annoyed) to find the flowers' thoughts are so far from their own human-centric concerns and needs. Requests for me to do videos over the years has been increasing, and so I've been doing more and more along these lines. Timelapses, tutorials, and new projects. 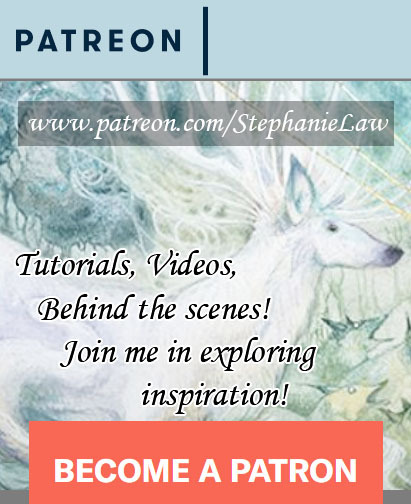 And a Patreon whose members help me to create more in depth tutorial videos, as well as receiving other subscription benefits like detailed walkthroughs of new pieces, advance access to originals, and behind the scenes peeks at things that are in the works.